Incredible original car! All original car including a majority of the black paint and mohair interior. Paint has a great patina as does the interior. Working vacuum fan on the steering column. Original 6 cylinder and 3 speed manual. All gauges and lights work. All windows function as they should. Original wooden spoke artillery wheels with original striping. Only 31k original miles. I can find no rust through on this car. This car was in the same family for 75 years. Purchased new by Pearl Williams (born 1889) from Middleton, Wisconsin (her operators permit included). Pearl’s grandson brushed clear on the car approx. 50 years ago to save the paint. There have been sections on the rear of the car that have been repainted. The car was stored in a barn and maintained by the grandson for grandma until her passing. 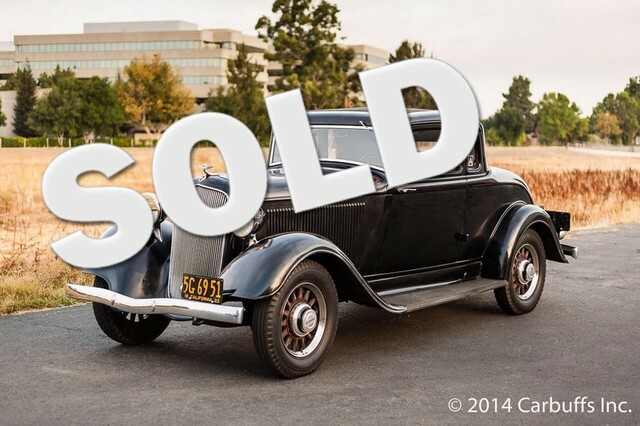 The second owner purchased the car 6 years ago and sold it to the current owner last year. Due to a full garage the current owner has decided to part with the car. During his ownership he did some repairs and maintenance to make the vehicle more functional including; new head gasket with head machining, new waterpump, original honeycomb radiator boiled and repaired, new fuel pump, carburetor rebuilt, gas tank boiled and resealed, generator rebuilt, and recent battery. New master cylinder, brake cylinders, hoses and new front shoes. Has original 1933 dated spare tire. The 1933 Plymouth was the first year for hydraulic brakes and fully pressurized engine with an oil pump and the last year for wooden wheels. This particular car has the $40 high speed wheel option and still retains its original wheels. Also includes the original jack, engine crank, tools and owners manual. This car runs and drives great.